Get to market faster with SolidWorks®, the standard in 3D mechanical design software. SolidWorks offers unmatched performance and value, leadership in innovation, and the largest community of users. No other CAD system allows you to get product design work done as quickly and accurately. If you know Microsoft® Windows®, you’re well on your way to designing with SolidWorks. Familiar Windows functions like drag-and-drop, point-and-click, and cut-and-paste allow you to become productive in hours, proficient within weeks. Create 3D models from existing 2D data with the best available transition tools. Enjoy unmatched design communication capabilities, such as the built-in eDrawings application, providing a breakthrough in sharing 2D and 3D product design information. Mastercam is the most commonly used CAD/CAM software worldwide* and remains the program of choice among CNC programmers. Mastercam X is the next generation of our popular program, delivering a new simplified, customizable interface with more power, and solid modeling tools designed for the NC programmer. From conceptual design through drafting and detailing, AutoCAD 2007 is all you need to create, visualize, document, and share your ideas. AutoCAD 2007 combines the familiar AutoCAD commands and user interface that you already know with an updated design environment, giving you the power to shape and explore your ideas like never before. An updated conceptual design environment makes the creation, editing, and navigation of solids and surfaces simple and intuitive. With all the tools in one place, turning your thoughts into designs comes easily. Improved navigation tools enable designers to directly interact with their models during creation and editing, making design alternative exploration more productive. CATIA V5 is the leading product development solution for all manufacturing organizations, from OEMs through their supply chains to small independent producers. The range of its capabilities allows CATIA V5 to be applied in a wide variety of industries, such as aerospace, automotive, industrial machinery, electrical, electronics, shipbuilding, plant design, and consumer goods, including design for such diverse products as jewelry and clothing. CATIA V5 is the only solution capable of addressing the complete product development process, from product concept specifications through product-in-service, in a fully integrated and associative manner. It facilitates true collaborative engineering across the multi-disciplinary extended enterprise, including style and form design, mechanical design and equipment and systems engineering, managing digital mock-up, machining, analysis, and simulation. CATIA products are based on the open, scalable V5 architecture. By enabling enterprises to reuse product design knowledge and accelerate development cycles, CATIA V5 helps companies speed their responses to market needs and helps free users to focus on creativity and innovation. As the company's flagship product, ABAQUS/Standard enables a wide range of linear and nonlinear engineering simulations to be carried out efficiently, accurately, and reliably. The extensive analysis capabilities, superb performance, thorough documentation, high quality, and best-in-class support make ABAQUS/Standard an effective tool for many engineering analyses. Gibbscam is a state-of-the-art, PC-based computer-aidded manufacturing (CAM) system for programming computer numerically controlled (CNC) machine tools. It's organized as a single application. The base package's capabilities can be optionally extended through the addition of seamlessly integrated modules. This way the sistem can be configured for your initial needs and be gradually expanded as your needs grow protecting your investment. SolidCAM is the complete, ‘best-in-class’ Manufacturing Suite for efficient and profitable CNC-Programming inside SolidWorks. SolidCAM provides seamless single-window integration and full associativity with the SolidWorks design model. CamTrax helps the designer create solid models of virtually every type of cam with the dynamic motion control parameters your system requires. During the design, CamTrax™ generates charts when linked with Excel and adds a profile list to your drawing. Camnetics, Inc. is dedicated to providing the design engineer with accessible software for developing high speed machine cams! CamTrax standard cam types include cylindrical cams, plate (aka disk) cams and linear cams. Choose the follower type that the design requires; on center translating, off center translating, swinging arm and flat-faced reciprocating. Selecting different motion synthesis is a snap with CamTrax. Choose between virtually any standard cam motion with a couple mouse clicks. With Excel the designer can analyze the cam motions and compare different motion synthesis. Don't have Excel? Output can also be to a text file! Charted are displacement, velocity, acceleration, pressure angle, cam shaft torque, radius of curvature, contact stress and normal force. GearTrax provides the designer with an easy to use tool for creating solid models of drive components. Create spur, helical, straight bevel and involute splines with true involute tooth profiles. GearTrax is intuitively easy to use for the designer with limited gear experience yet powerful enough for the gear expert. The animation window shows the spur/helical gear mesh which updates as the data is changed. It is extremely useful in understanding how changes to the gear parameters reflects on the gear mesh. GearTrax is more than a library program. Each part model is created with it's specific requirements just as a designer would, but rather than taking hours or days, the part is created in seconds. GearTrax creates solid models of spur and helical gears, bevel gears, worm gears, involute splines, timing belt pulleys, chain sprockets and V-belt pulleys. GearTrax also integrates with Excel to create data sheets. 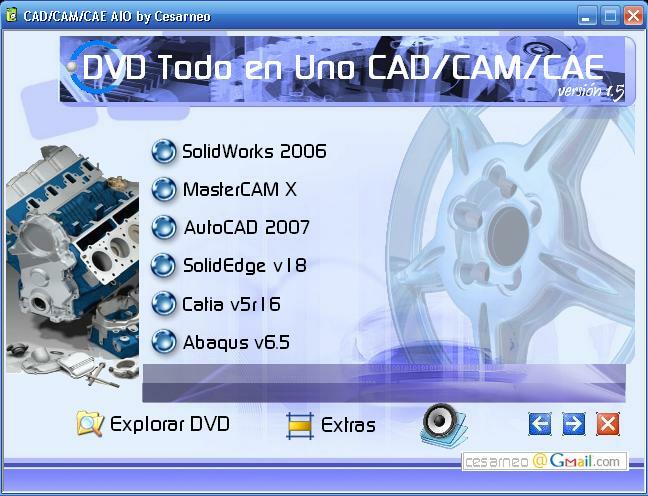 The interface is designed in spanish, but almost all of the applications are in english, as far as I know only Solidworks is in spanish. The User Manuals are in spanish. Once downloaded u have to burn it in a double layer dvd. La interface y el proyecto en general esta diseñado para usuarios en español y se buscó, en la medida de lo posible, integrar programas en español. Saludos a todos en especial a mi gente de Mexico.